This walk: 2011-12-2. Great Mis Tor, Little Mis Tor, King's Tor, Merrivale Quarry, Rundlestone Tor, North Hessary Tor tv transmitter, pre-1867 Dartmoor Forest boundstones, prison leat, Fice's Well, DCP stones, Great Mistor pan. Great Mis Tor, SX 563 769, elevation 538 metres (1765 feet) with Little Mis Tor at right (elevation 480 metres; 1574 feet). Zoomed view to south, King's Tor, SX 556 739, elevation 400 metres (1312 feet). Zoomed view to Merrivale Quarry. Zoomed view to Rundlestone Tor, SX 577 746, elevation 480 metres (1574 feet) with the North Hessary Tor TV transmitter behind and left. Zoomed view to Little Mis Tor with Little Little Mis Tor at left. Unusual view of Little Mis Tor at left with Great Mis Tor behind. Boundary stone close to SX 56937 75803 ..... This stone is on the boundary of the Royal Forest of Dartmoor as defined by the perambulations of 1240 and 1608, in a straight line from North Hessary Tor to Great Mis Tor. An 18th century boundary had deviated from the line and by 1867 the direct line was re-established by the erection of several plain boundstones (such as this one) by the Duchy. Source: Dave Brewer (2002) Dartmoor Boundary Markers, Halsgrove, page 34. Another view of the stone, beside the fence that limits the land of Dartmoor Prison: somewhere near the stile is a DCP (Directors of Convict Prisons) stone, of which, more below. Another view, showing steps up to the leat bank. Another view of what appears to be a deep channel that runs under a track. A modern form of stile - but the gate was not locked! Fice's Well. The story tells that John Fitz (locally known as Fice) and his wife became lost in the mist in this area, eventually coming across the bubbling spring that is now the well. On drinking from the spring, the mist magically lifted and they could see they were close to the Rundlestone and the Princetown road. In gratitude, he had a stone shelter erected over the spring. Stories circulated about the well's curative powers, esp. for eye conditions. The circular wall was added in the C19th when the newtake wall was built. In 1906, a prisoner digging peat 400 yards north of the well found an 18-inch Bronze Age rapier (and numerous oak tree boles). The rapier is now in Plymouth Museum, along with other Dartmoor artefacts. Blurred entrance to the well. The well, a covered spring. Steps inside the circular wall. Showing the scale of the structure. A Directors of Convict Prisons stone at SX 56937 75803 marking the boundary of the prison land. Originally it had 390 acres granted but this was extended by 1,000 acres in 1867 when the whole area was marked by these boundary stones. The Directors of Convict Prisons was a body founded in 1850 following the ending of transportation from 1840 and the phasing out of prison hulks in Plymouth, Portsmouth and other places. The stone is marked as 'DCP1' on the map below.Source: Dave Brewer, Dartmoor Boundary Markers, Halsgrove (2002), pp. 260-262. Closer view of the stone. Great Mis Tor seen along the prison fence, and along the boundary of Dartmoor Forest, with Little Mis Tor to the left. Another view of Little Mis Tor with Little Little Mis Tor. Another pre-1867 boundstone marking the edge of Dartmoor Forest, at SX 56659 76239, marked as BS2 on the map below..
Another DCP stone at SX 56574 76412 marking the corner of the prison land, marked as 'DCP2' on the map below. Another view of Great Mis Tor. As previous photo, taken near Little Mis Tor. Looking at Great Mis Tor from Little Mis Tor. Another view from Little Mis Tor. Military flag staff on the tor. Another Pixies' Cave? At SX 56268 76883. Cox Tor in the distance, with Great Staple Tor (left) and Roos Tor (right) and Beckamor Dip (the water) in between. The north face of Great Mis Tor, the famous 'pan' (next photo) is in the top-most stone, left of the flagstaff. Great Mistor pan, at SX 56267 76932, a worn depression in the rock. The lip on the right was vandalised many years ago. The pan is on the top stone of the pile: this photo was taken standing by the flagstaff, looking north. The building at bottom right is the range warden's hut. A precarious pile of rocks! Part of the rock field that extends down the west flank of Great Mis Tor as far as the newtake wall. 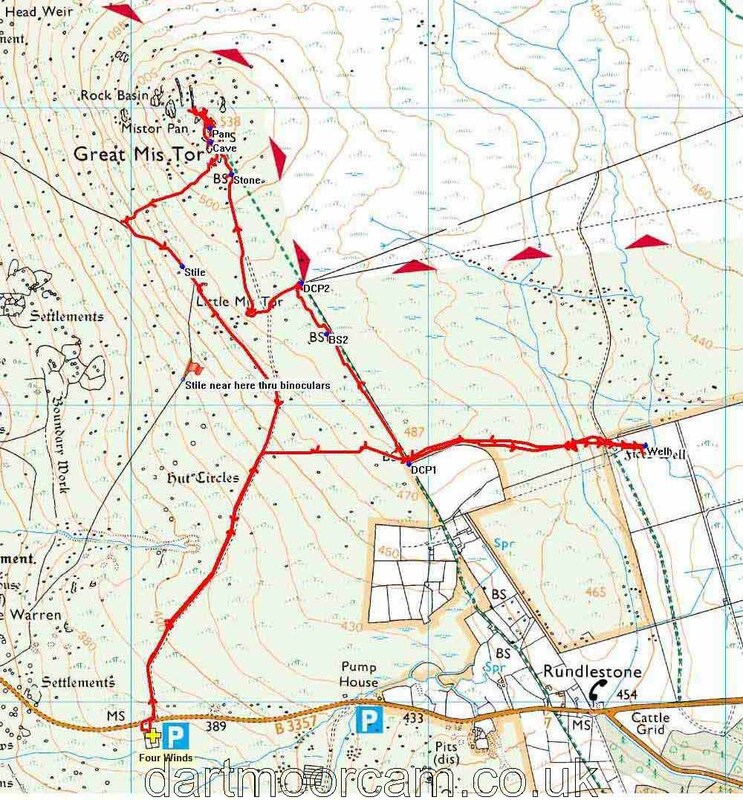 This walk can be reached from Tavistock or from the Princetown direction on the B3357, parking a little east of Merrivale at the Four Winds car park, marked by the yellow cross and the P symbol on the map. The parking area is by a stand of trees. Distance - 8.37 km / 5.2 miles.